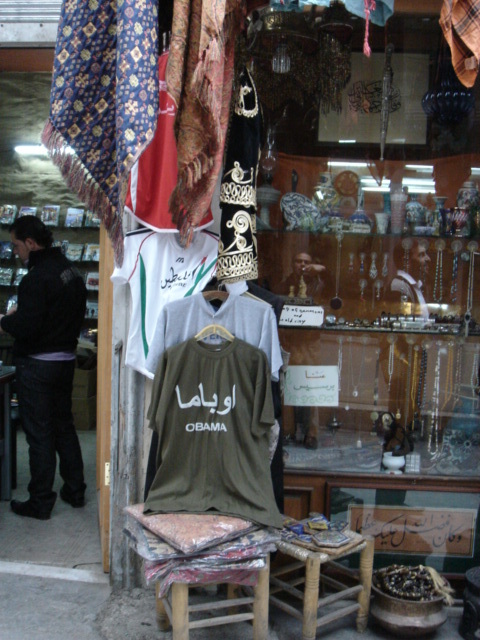 Look what was hanging outside a shop in Damascus’ Old City. Shops close by were full of t-shirts, key chains and posters of Hezbollah leader Hassan Nasrallah, Imam Ali, Hafez, Basel and Bashar al-Assad but Nabih Al Saghir’s Rainbow Stores wore its love clearly on the store door. I bought a couple of the t-shirts and had a chat with Nabih Al Saghir, owner of Rainbow Stores. “I was sitting with my son; he asked me “who do you think will win”. I told him for sure “McCain”. He said I think Obama will win and because he felt that way he wanted to make a t-shirt for Obama. I told him I wasn’t sure how people would react here in Damascus, we love peace and we pray for peace and god willing you will be right. We didn’t expect it to be so popular. Obama’s younger age worked in his favour but we didn’t think it would be possible. America has a problem with the world so maybe it will choose Obama to solve its problems with the second world and the third world. Most people wanted Obama, maybe because he is of African origin, but he is American first and last but we had a feeling that Obama would represent change for the better for America. We love America – its industry is good, people from all over the world are there, and maybe that’s why we love it. Many of our friends are there. I have several friends and relatives who live there. And I’ve met Americans through my work and I’ve got to know them. 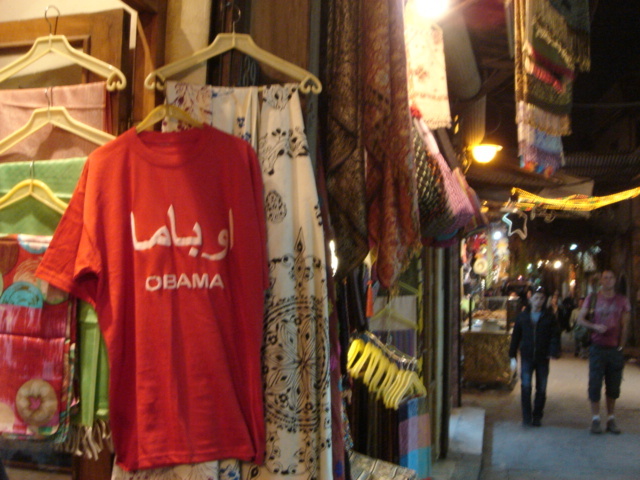 There is a demand for the (Obama) t-shirts. Not too many Syrians. Some of them were surprised we had the courage to hang an Obama t-shirt outside. I heard some comments. One person today asked if I got permission to hang the t-shirt outside the store. I heard him asking my son. He warned my son I’m an annoying person but I must ask you if you got permission. My son said no we didn’t ask for permission but we have democracy! Most buyers are Europeans. And young Americans here to study or in Jordan or here as tourists. They were very surprised. This is the second interview with the media. Nasrallah is another issue. Obama has nothing to do with Nasrallah. We want to support Nasrallah with all we have but he’s another issue. Are they alike? Obama helps the poor. And Nasrallah does too. We are the ones who always suffer. It makes us happy that someone (like Nasrallah) fights back and whose army is well trained and disciplined. My message to Americans would be to care about people of other countries. I wonder when people will understand that all religions are there to make people better , religion is just a way to do that , and people should be valued on how good they are not what their religion or ethnic background and until then the Mideast is in for a rough ride.